Two container ships collide in Egypt’s Suez Canal. Two ships collide in Suez Canal. Two container ships passing through Egypt’s Suez Canal collided near the northern opening of the waterway, officials said on Monday. 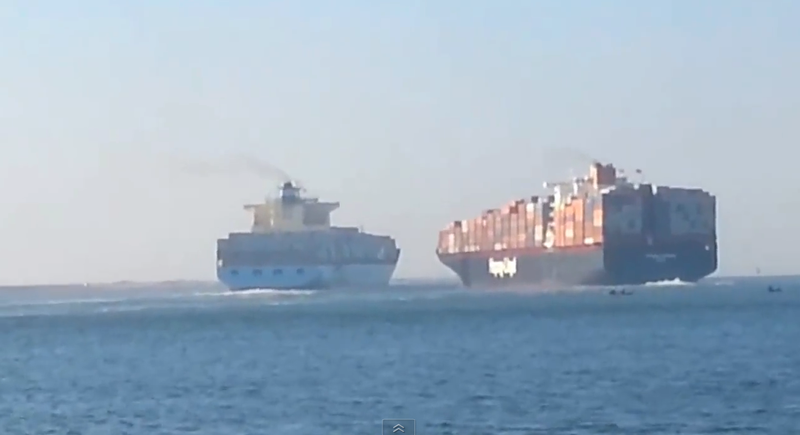 The two vessels—the German-flagged MV Colombo Express (right) and the Singaporean-flagged MV Maersk Tanjong (left)—collided when the Colombo Express appears to veer left suddenly during an apparent attempt to overtake the Maersk Tanjong. The slow-motion collision did not result in any casualties, but knocked four of the Colombo Express’ containers into the canal. The crash shut down traffic on the heavily travelled canal for three hours. “The Suez Canal is one of the world’s most strategic waterways, facilitating much of the maritime trade between Europe and Asia,” Reuters notes.